Every day from 12:00 m. to 11:30 p.m. The green, the breeze, the birds singing, the sound of water and the smells and flavors that proposes the kitchen of this space invite you to relax. 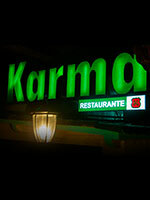 Karma is designed so that the no matters the reason that take you to their spaces, it always have the same effect: your return to find that peace of good food, efficient service, nice music. Like a mantra the team says: "We are result of what we were and will result in what we are". Karma wants a morning full satisfaction for you based on the power of healthy food.